The objective of this project is to advance understanding of the role of the biosphere in the climate of tropical regions. During the last few years, we developed a general theory that defines the role of vegetation in sustaining large scale atmospheric circulations, and in shaping the climate of the tropics. 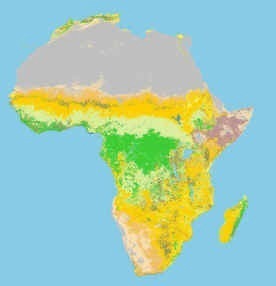 We applied this theory in investigating the role of vegetation in the dynamics of West African monsoons and obtained new insights regarding the possible link between observed deforestation and occurrence of droughts. Although, in the past we concentrated on the problem of defining the role of the static vegetation in climate processes at the interannual time scale, we are currently investigating the two-way interactions between vegetation dynamics and atmospheric variability at decadal and longer time scales. The objective of the research in the Amazon region is to evaluate the impact on regional climate and surface hydrology due to the expansion of current patterns of deforestation in Brazilian Amazonia. Earlier work in this project resulted in a new quantitative characterization of the regional hydrological cycle in the Amazon region. We explored the impact of medium-scale deforestation on climate, and proposed new mechanisms for land-atmosphere-ocean interactions over the Amazon basin. 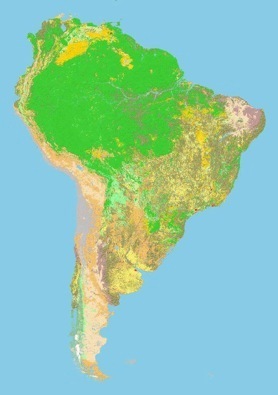 A high resolution mesoscale climate model has been developed to use satellite estimates of deforestation patterns in the Amazon in order to predict their impact on regional hydrology. The same model will assimilate information about precipitation from NASA’s Tropical Rainfall Measuring Mission (TRMM). Eltahir, E. A. B., 1992. Drought Frequency Analysis of Annual Rainfall Series in Central and Western Sudan, Hydrological Sciences Journal, 37: 185-199. Eltahir, E. A. B. and C. Gong, 1996. Dynamics of Wet and Dry Years in West Africa, Journal of Climate, 9(5): 1030-1042. Eltahir, E.A.B., 1996. The Role of Vegetation in Sustaining Large-scale Atmospheric Circulations in the Tropics, Journal of Geophysical Research,101(D2): 4255-4268. Gong, C. and E. A. B. Eltahir, 1996. Sources of Moisture for Rainfall in West Africa, Water Resources Research, 32(10): 3115-3121. Zheng, X. and E. A. B. Eltahir, 1997. The Response to Deforestation and Desertification in a Model of West African Monsoons, Geophysical Research Letters, 24(2): 155-158. Zheng, X. and E. A. B. Eltahir, 1998. The Role of Vegetation in the Dynamics of West African Monsoons, Journal of Climate, 11(8): 2078-2096. Zheng, X., E. A. B. Eltahir and K. A. Emanuel, 1999. A Mechanism Relating Tropical Atlantic Spring Sea Surface Temperature and West African Rainfall, Quarterly Journal of the Royal Meteorological Society, 125(556): 1129-1164. Kiang, J. and E. A. B. Eltahir, 1999. The Role of Ecosystem Dynamics in Biosphere-Atmosphere Interactions over the Coastal Region of West Africa, Journal of Geophysical Research,104(D24): 31,173-31,189. 9.Wang, G. and E. A. B. Eltahir, 2000. Biosphere-Atmosphere Interaction over West Africa: 1. Development and Validation of a Coupled Dynamic Model, Quarterly Journal of the Royal Meteorological Society, 126(565): 1239-1260. Wang, G. and E. A. B. Eltahir, 2000. Biosphere-Atmosphere Interaction over West Africa: 2. Multiple Climate Equilibria, Quarterly Journal of the Royal Meteorological Society, 126(565): 1261-1280. Wang, G. and E. A. B. Eltahir, 2000. Modeling the Biosphere-Atmosphere System: The Impact of Sub-Grid Variability in Rainfall Interception, Journal of Climate, 13: 2887-2899. Wang, G. and E. A. B. Eltahir, 2000. The Role of Vegetation Dynamics in Enhancing the Low-Frequency Variability of the Sahel Rainfall, Water Resources Research, 36(4): 1013-1021. Wang, G. and E. A. B. Eltahir, 2000. Ecosystem Dynamics and the Sahel Drought, Geophysical Research Letters, 27(6): 795-798. Wang, G. and E. A. B. Eltahir, 2002. Impact of CO2 Concentration Changes on the Biosphere-Atmosphere System of West Africa, Global Change Biology, 8: 1169-1182. Irizarry-Ortiz, M. M., G. Wang and E. A. B. Eltahir, 2003. Role of the Biosphere in Mid-Holocene Climate of West Africa. Journal of Geophysical Research, 108(D2): 4042, doi:10.1029/2001JD000989. Wang, G., E. A.B. Eltahir, J. A. Foley, D. Pollard and S. Levis, 2004. Decadal variability of rainfall in the Sahel: results from the coupled GENESIS-IBIS atmosphere-biosphere model. Climate Dynamics, 22: 625-637. Kim, Y. and E. A. B. Eltahir, 2004. Role of Topography in Facilitating Coexistence of Trees and Grasses within Savannas, Water Resources Research, 40(7): W07505, doi:10.1029/2003WR002578. Eltahir, E. A. B. and R. L. Bras, 1993. Estimation of the Fractional Coverage of Rainfall in Climate Models, Journal of Climate, 6: 639-644. Eltahir, E. A. B. and R. L. Bras, 1993. A Description of Rainfall Interception Over Large-areas ,Journal of Climate, 6: 1002-1008. Eltahir, E. A. B. and R. L. Bras, 1993. On the Response of the Tropical Atmosphere to Large-scale Deforestation, Quarterly Journal of the Royal Meteorological Society, 119: 779-793. Eltahir, E. A. B. and R. L. Bras, 1994. Precipitation Recycling in the Amazon Basin, Quarterly Journal of the Royal Meteorological Society, 120: 861-880. Eltahir, E. A. B, and R. L. Bras, 1994. Sensitivity of Regional Climate to Deforestation in the Amazon Basin, Advances in Water Resources, 17: 101-115. Eltahir, E. A. B., and J. Pal, 1996. Relationship Between Surface Conditions and Subsequent Rainfall in Convective Storms, Journal of Geophysical Research, 101(D21): 26,237-26,245. Wang, J., R. L. Bras, and E. A. B. Eltahir, 1996. Stochastic Modelling of Thermally Induced Atmospheric Flow at the Mesoscale, Meccanica, 31: 15-25. Wang, J., R. L. Bras, and E. A. B. Eltahir, 1996. A Stochastic Linear Theory of Mesoscale Circultaion Induced by the Thermal Heterogeneity of the Land Surface, Journal of the Atmospheric Sciences, 53(22): 3349-3366. Eltahir, E. A. B., and E. J. Humphries, 1998. The Role of Clouds in the Surface Energy Balance over the Amazon Forest, International Journal of Climatology, 18(14): 1575-1591. Wang, J., E. A. B. Eltahir and R. L. Bras, 2000. On the Impact of Observed Deforestation on the Mesoscale Distribution of Rainfall and Clouds in Amazonia, Journal of Hydrometeorology, 1: 267-286. Eltahir, E. A. B., B. Loux, T. K. Yamana, and A. Bomblies, 2004. A See-Saw Oscillation Between the Amazon and Congo Basins, Geophysical Research Letters, 31, L23201, doi:10.1029/2004GL021160.